I just love the humorous sets at Art Impressions and this one is no exception! 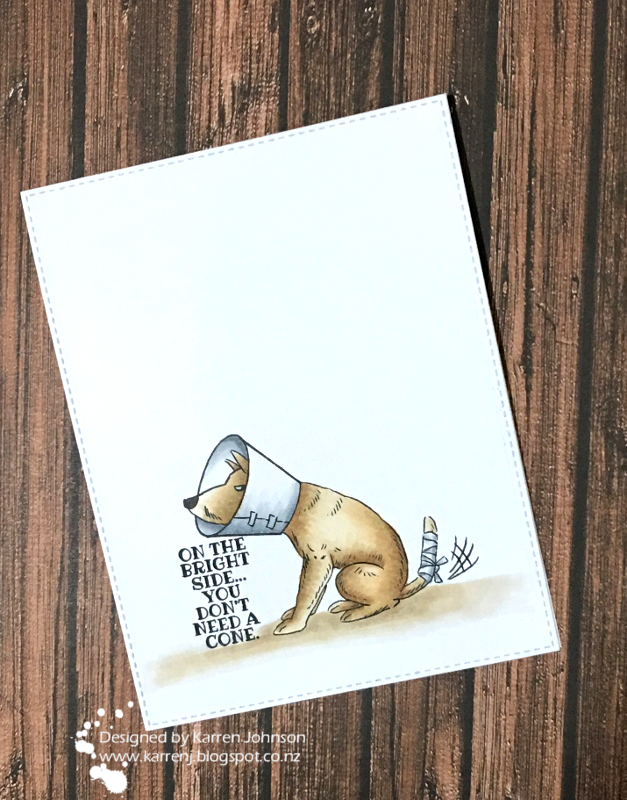 I used Doggy Kisses to make a one-layer card and I'm entering it into CAS(E) This Sketch, Art Impressions white space challenge and Simon Says Stamps Wednesday Challenge. I stamped the very unamused looking dog onto X-Press It cardstock and colored him with Copics. I then die-cut it with a stitched frame. I stamped the sentiment as if he's resting his head on it and added in some ground. In case it's not immediately obvious, I flipped the CTS sketch and used images to represent each of the elements. Oh man, this dog just cracks me up. I remember when our dog Dexter had his manhood removed when he was a puppy and we had to put a cone on him. As soon as we put it on, he turned into a statue and wouldn't move until we took it off again. He was obviously terrified but it was pretty funny at the same time. Edited to Add: This card got a shout out at Art Impressions. Ahh Karren I love it. We recently had to put a cone on Jake and kept calling him cone head. He looked so funny and got so frustrated when food got caught on the overlap. Great card and love love that stamp. I love this!! 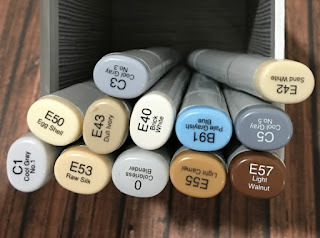 I must have this set! Whenever Atticus had to have a cone he would just stand with it pressed up against the wall and not move. Poor guy! Fabulous card. I totally need this stamp set! This is just too cute! But poor Dexter!! Karren this guy just cracks me up! I find it funny that, no matter that his tail is bandaged, he's still wagging it to beat the band! 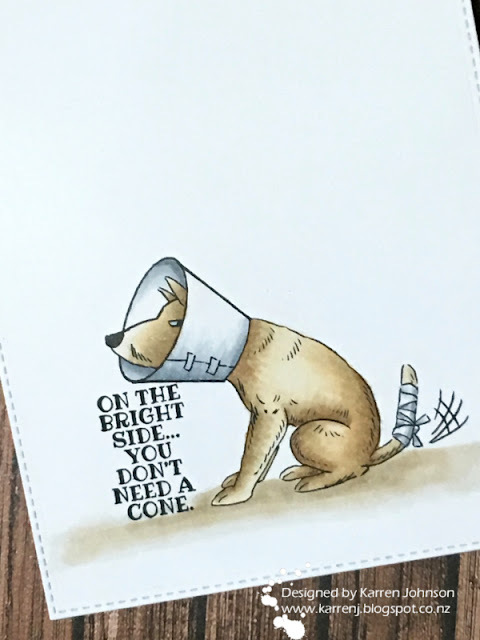 Your 'cone of shame' is fabulous! Very fun take on the sketch, Karren! Fabulous CAS card Karren! 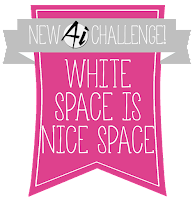 That image is so cute & just perfect for our challenge. Clever creative take on the sketch Karren! And that face! Spare me the day that Sugar needs a cone. He is such a busy one, he would HATE it! Made me laugh out loud!!! That card is too cute and I love it!